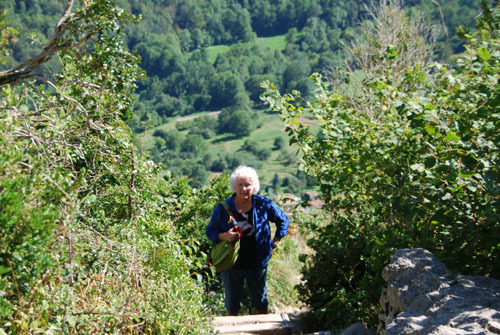 Montségur is in the Ariege, in the foothills of the Pyrenees, not far from Lavelanet, due South from Mirepoix. 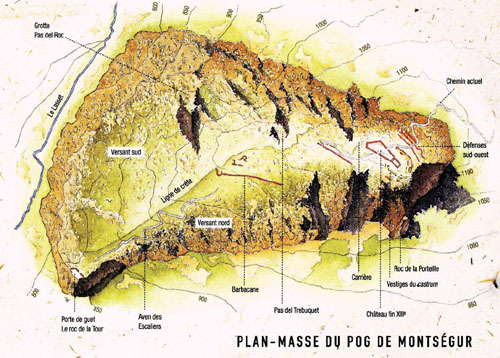 Montségur lies at 42°52'35" N, 1°49'51" E on a pog (a volcanic pluton) at an altitude of 1,207 meters. The castle is owned by the Commune of Montségur. There is an entrance fee, which also covers entry to a museum in the nearby town. 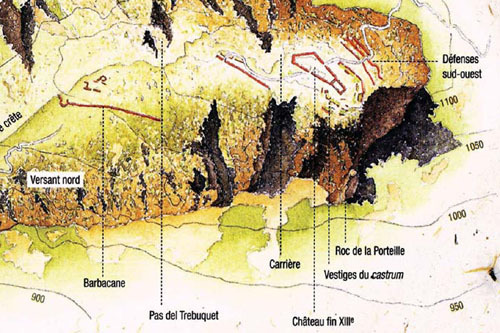 The earliest signs of human settlement in the Montsegur area date to the stone age, around 80,000 years ago. It was also occupied by the Romans. 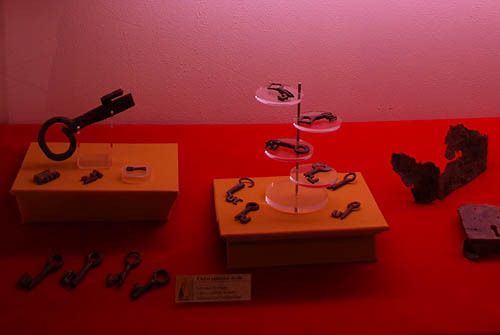 Evidence of Roman occupation, including Roman currency and tools have been found around the site. 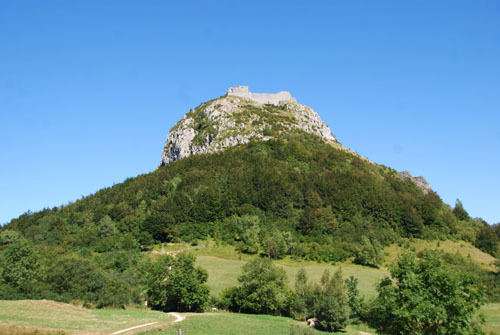 The Occitan name Montsegùr (French Montségur) comes from Occitan mont ségur (Latin mons securus) which means "safe hill". In the Middle Ages the Montsegur region was ruled by the Counts of Toulouse, the Viscounts of Carcassonne and finally the Counts of Foix. 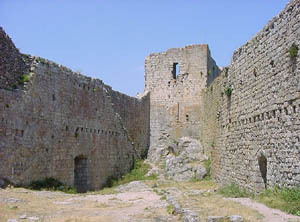 Little is known about the fortification until the time of the Albigensian Crusade. 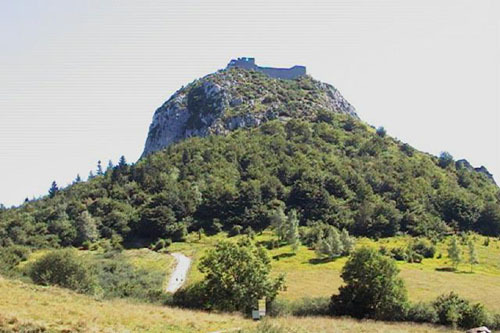 Archaeologists call this early castle Montsegur I. 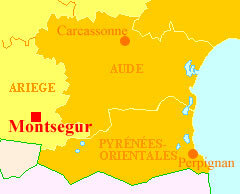 The name in French is spelled Montségur, and in Occitan, Montsegùr. 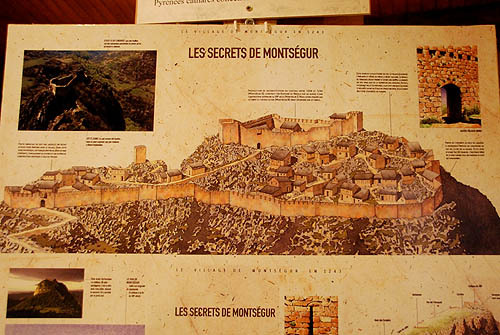 In the early thirteenth century the lordship of Montsegur was shared between two cousins, Raymond de Péreille and Pierre-Roger de Mirepoix. 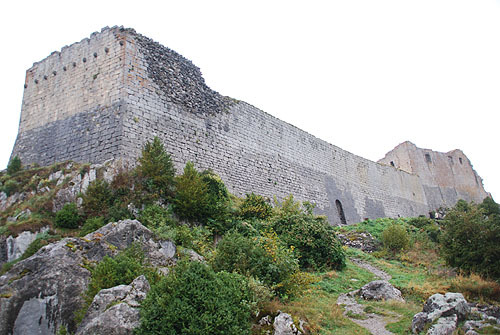 In about 1204, Raymond de Péreille decided to rebuild the castle, which had been in ruins for 40 years or more. This as a prescient act in view of the Crusade launched against the people of the Languedoc just a few years later. 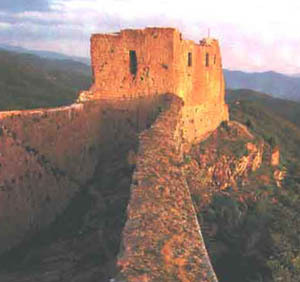 Rebuilt, the castle became a centre of Cathar activities, and home to Guilhabert de Castres, a Cathar bishop. 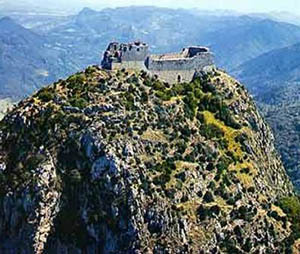 This castle is known to archaeologists as Montsegur II and has the strongest claim of any castle to the title "Cathar Castle". In 1233 it became "the seat and head" (domicilium et caput) of the Cathar church. It provided a refugee centre for "faidits" - lords who had been stripped of their lands and goods by the Roman Church. These faidits, counterparts of the more recent maquis, continued to wage a guerilla war against the invaders. 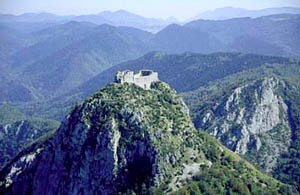 Montségur housed about 500 persons within the castle precincts and in the adjacent village perched on the mountainside. 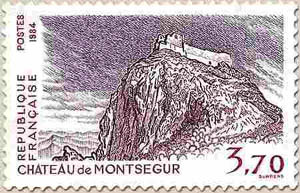 Under pressure to comply with the requirements of the Church, Raymond VII made a token attempt to capture Montségur in 1241. In 1242 a putative uprising was organised as part of a coordinated plan against Louis IX of France agreed by Henry III, King of England. The Holy Roman Emperor, The King of Aragon ,Raymond VII the Count of Toulouse, the Count of Foix, and the dispossessed Viscount of Carcassonne. For various reasons the whole enterprise fizzled out, and almost the only notable achievement was a raid by 50 or so warriors from Montsegur who killed two inquisitors, William Arnald and Stephen de Saint-Thibéry, along with their retinue, at Avignonet on 28 May, 1242. Following the massacre at Avignonet, the Council of Béziers in 1243 decided to destroy the last vestiges of Catharism. 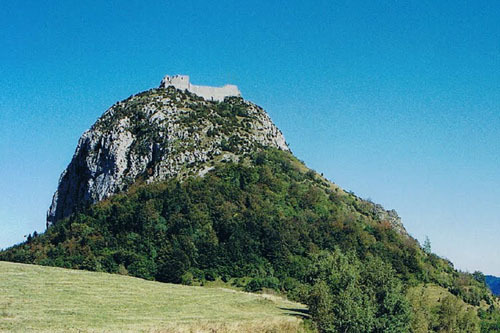 The Cathar sympathisers responsible for killing the Inquisitors at Avignonet were known to have come from Montségur. 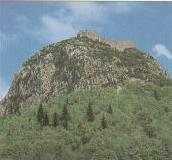 The Council therefore decided to "cut off the head of the dragon" by which they meant to take the château at Montsegur, the last remaining major centre of Cathar belief. The château, perched on top of a majestic hill (called a pog), had already been reinforced. The castle was besieged later in 1243 by the Archbishop of Narbonne, another bishop and Hughes des Arcis, Seneschal of Carcassonne for the King of France. In May 1243 the seneschal Hugues Des Arcis led about 10,000 royal troops against Montsegur which was held by about 200 faidit fighters. Also inside were around 300 others - around 200 parfaits and parfaites who as pacifists took no part in the fighting, and 100 or so other refugees, generally family members (non-Parfait women and children). The initial strategy was to besiege the castle in expectation that water and supplies would run out, a strategy that had worked well for the crusaders at Carcassonne, Minerve and Termes. The defenders at Montsegur were well supplied and in spite of the presence of 10,000 - 20,000 besiegers, kept their support lines open, supported by many of the local population. For months, defenders were free to come and go, allowing reinforcements into the castle. Throughout the Summer and Autumn, the siege was unsuccessful. 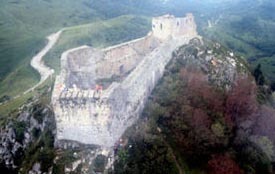 Eventually the French forces decided to attack the castle directly, a difficult task due to its well protected location high on a massive limestone rock. 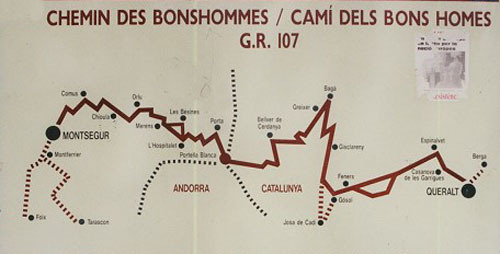 After many failures, Basque mercenaries skilled in mountain climbing, scaled a cliff face on the eastern side of the summit during the night. The climb had seemed impossible so the position on top had not even been provided with a look-out. From here it was possible to haul up further men and weapons - enough to take the strategically critical nearby post at the Roc de la Tour. From here the French slowly fought their way a mile or so up a slope towards the castle. By the end of January, under the direction of a Catholic bishop specialising in war machines, the French were able to construct trebuchets to bombard the defenders' outer barbican. The defenders summoned an engineer to build a trebuchet in an attempt to destroy the attackers' trebuchets, but to no avail. By mid February the French had taken the barbican. They now dismanted their trebuchets, reconstructed them on the barbican, and started to bombard the castle itself. 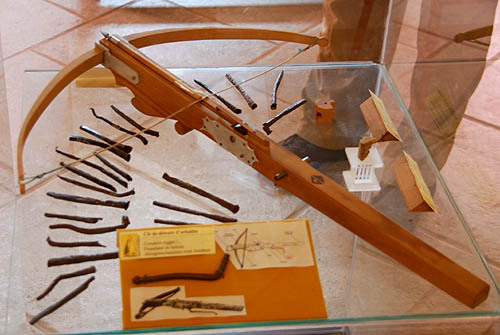 [Incidentally we know this by piecing together sketchy written records and physical surviving evidence - trebuchet stones and crossbow quarrels, and even some skeletons]. Meanwhile, the refugees living in houses outside the walls of the castle were forced to move inside, making living conditions even more difficult. Two weeks later the crusaders made an attack which only just failed. The defenders accepted that their position was impossible. The two Lords of Montsegur, Pierre-Roger de Mirepoix and Raymond de Péreille negotiated the surrender with the French maréchal Guy de Lévis (who would become the new Lord of Montsegur after its rendition). They surrendered on 2 March 1244 having negotiated a truce of two weeks, after which the Parfaits would have to abjure their faith or burn alive. During this two week truce, two to four perfects (sources disagree about the number) escaped over the castle walls, taking with them the Cathar "treasure". Nothing more is known about the nature of this treasure, a lacuna that has been filled by a large amount of fanciful speculation, mainly on the part of mystics whose knowledge of Catharism is less than comprehensive. For the perfects at Montsegur, these last two weeks were spent praying and fasting. A number of the garrison and others decided to join the ranks of the 200 or so perfects, and received their consolamentum on 13th March, bringing the total number of Cathar believers destined to burn to around 225. The most moving part of later Inquisition records about this period recount the parfaites giving away their personal possessions to their non-parfait friends and relatives - clothing, jewellery, spices and so on. 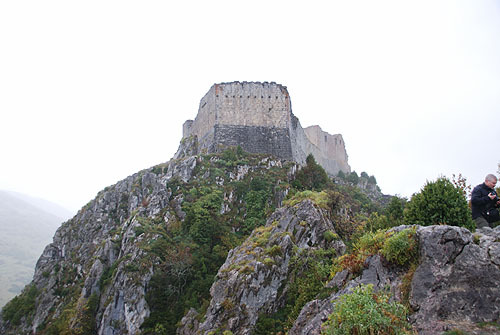 At the end of the two-week truce, all those trapped in the castle were allowed to leave except those who would not adopt the Catholic faith, which, as at other defeated Cathar strongholds, meant all of the Perfects. 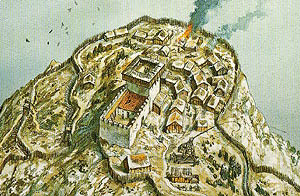 On 16 March all of the parfaits, led by Bishop Bertrand Marty, left the castle and went down to a field where a pyre had been erected. Among them were the wife and daughter of Raymond de Pereille. There were too many victims for individual stakes so a pen had been built with piles of firewood inside. The perfects mounted the pyre and perished, passing, according to one Catholic source, from the flames of this world directly to the flames of the next. The nobles among the victims were all related to each other. They included three generations of one lordly family - grandmother, mother and daughter. As always on such occasions, churchmen song hymns of joy and gave thanks to God. Under the terms of the surrender, the remainder of the defenders, including some who had participated in the murder of the inquisitors at avignonet two years earlier, were allowed to leave. Among them was Raymond de Pereille. Like all other survivors he was questioned by the Inquisition (one reason we know as much as we do about events here). Catharism continued in the Languedoc for many decades but it had lost its head and seat, and, under the pressure of the Inquisition, adherents moved to other places, notably Aragon or what is northern Italy, where conditions were less oppressive, at least for the time being. 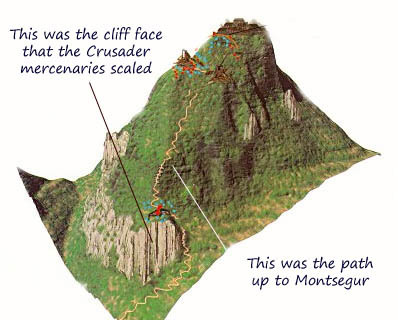 Montsegur II was destroyed and a new French castle, a royal fortress, was built on the site. 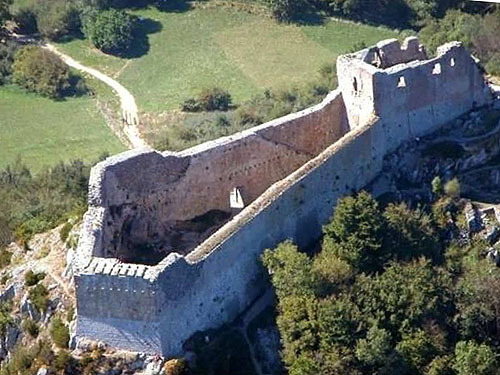 This one, known as Montsegur III, guarded France's new border. Today's ruins are those of the French border fortress Montsegur III. 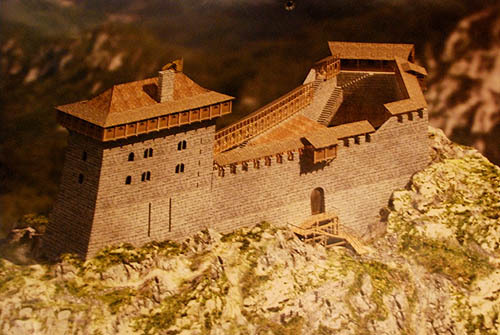 Despite this, you may well hear alleged experts on the Cathars expounding theories not only that the Cathars built this castle, but that for religious reasons they built it as a solar temple, in a perfect alignment with the rising sun. 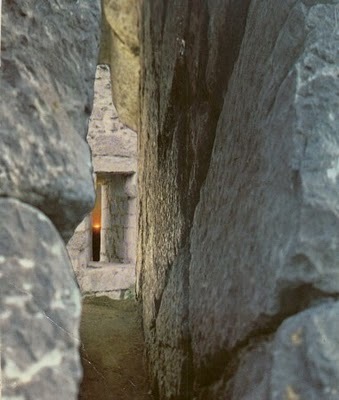 - perhaps a distorted version of the fact that the keep and and one wall are aligned on a South-east - North-west axis. 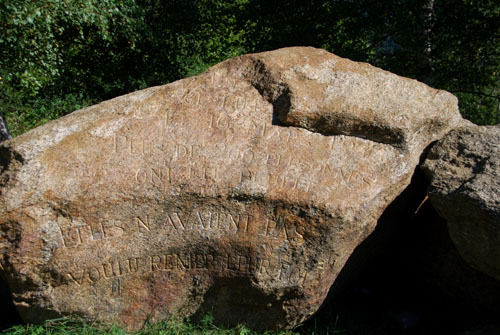 At the base of the mountain, in the "Prat dels Cremats" ("Field of the Burned" in Occitan) a modern stele commemorates the death of the victims. It is inscribed "Als catars, als martirs del pur amor crestian. 16 de març 1244" (Occitan for "The Cathars, martyrs of pure Christian love. March 16th, 1244"). PLUS DE 200 PERSONNES ONT ÉTÉ BRULÉES. ELLES N'AVAIENT PAS VOULU RENIER LEUR FOI. THEY CHOSE NOT TO ABJURE THEIR FAITH. 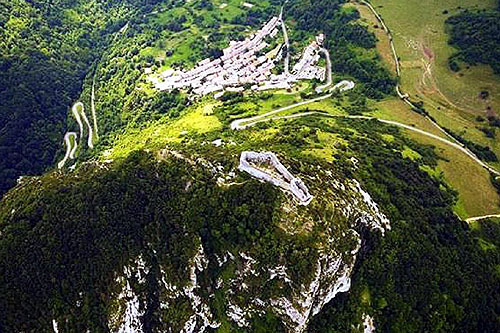 The story of the siege of Montségur is one of the most moving of all the tragedies associated with the war against the Cathars. Even the most hostile writers were struck by the significance of events at Montségur, when against expectation the ranks of the doomed Parfaits increased during the two weeks' truce. The Castle has been listed as a monument historique by the French Ministry of Culture since 1862. From the castle walls you can see the modern village of Montségur miles below..
Go through the postern gate and turn left. You can see the foundations of some Cathar buildings (the original village of Montségur) behind the present castle. These are the houses that had to be evacuated after the Crusaders took the barbican. If you carry on anticlockwise with the castle walls on your left, you can get to the donjon (keep) from the outside. 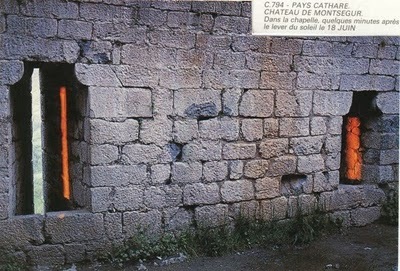 A single loophole (arrow slit) in the wall of the donjon, covers the courtyard. You can just see the castles at Puivert and Roquefixade from the keep if you know where to look. 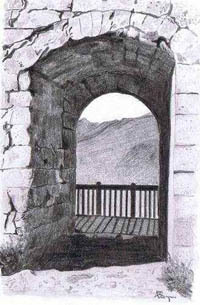 At the bottom of the pog on which the Castle sat is a monument next to the field where 225 Parfait were burned alive. . The French have a word for the act of burning people alive - they call it a Bûché. There is no exact counterpart in English. The nearest we have is burn at the stake. You may see the word translated in some literature as massacre or occasionally left as bûché in English translations. Many visitors take flowers, usually red and yellow, the colours of Aragon, of Toulouse and of Foix, to whom the victims all owed their allegiance. Crusaders (or Dominicans ?) 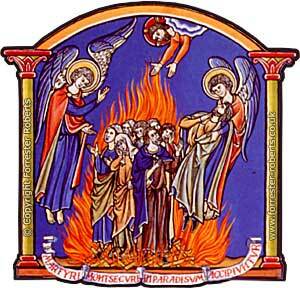 on the left supervise the burning of Cathar Parfaits on the right. White doves represent the Holy Spirit leaving the Cathars as they die. 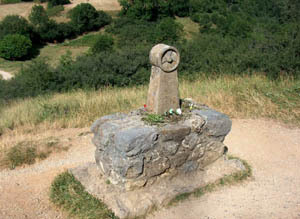 The pog of Montségur is shown in the background. Camping overnight at the site of the castle is forbidden. 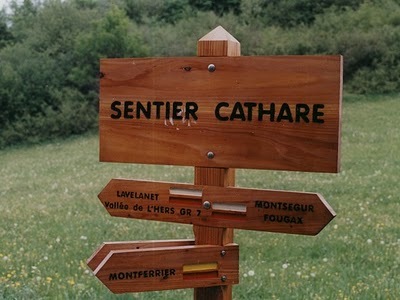 There are however places to stay in the nearby village of Montsegur, and nearby. Among them are La Taillade de Montségur: High quality chalets, built on spacious plots, bordered by shrubs and trees to maintain privacy, and integrated with the landscape, combining the freedom of camping with the comforts of a holiday cottage. The tragedy at Montsegur is remembered today in many ways. One of them is a story game invented by Frederik J. Jensen, called "Montsegur 1244"
The game is based on the events from the start of the Seneschal's siege, and introduces real historical characters such as Joudain du Mas. It also gives a good introduction to Cathar belief. Montségur from the East - an usual angle. Most tourists do not visit the barbican. On 16th March ,1244, the besieged refugees at the Château of Montsegur who refused to abjure the Cathar faith were burned en masse at the foot of the pog. Around 25 had taken the the Consolamentum three days previously, so becoming Parfaits or Parfaites, and knowing that this sealed their fates. They are regarded as martyrs by modern Gnostic Churches. Sources differ on the the number of victims. The Chronique de Guillaume de Puylaurens, gives the number as 200; the Chronique de l'Abbaye de Berdoues, states 205; The Chronique de St-Paul de Narbonne 215; and Gerard de Frachet 224. These chronicals do not attempt to list all the victims, so historians have had to piece together a partial list, mainly from Inquisition records. As far as I am aware, sixty-three individuals have so far been identified by name. The names of those who recieved the Consolamentum on the night of 13th March 1244 are marked with a . 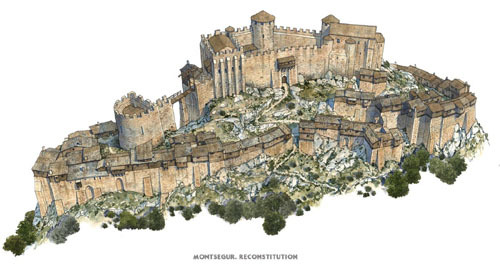 at Tarascon in 1204 and present at the Château of Montsegur from 1234. Resident at the Château of Montsegur from 1234 with his wife and three sons. present at the Château of Montsegur from the start of the siege, where he was a miller. from Mas Saintes-Puelles, sister of Parfait Raymond du Mas (Raymond de Na Rica). Crossbowman from Arnaud and seigneur of Usson. 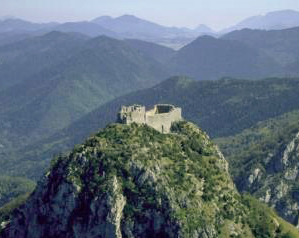 Arrived at the Château of Montségur around May-June 1243. 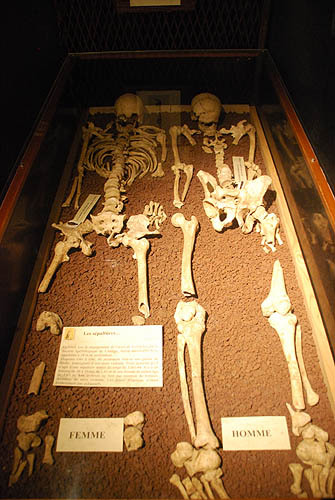 From Lavelanet, sergeant, wounded end of February 1244, received the Consolamentum March 4. Dispossesed knight from Caihavel. 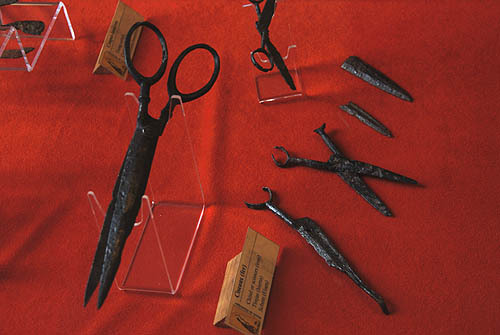 Present at the Château of Montségur from 1236.
from Gaja. parfait arrived at the Château of Montségur around 1242 with his son, a sergeant. Knight and seigneur of Les Casses. A believer since 1220 and a parfait before 1243. Present at the seige. Around 13 March 1244 is named as having transfered Church treasury into the custody of Pierre-Roger de Mirepoix. Knight from Laurac. 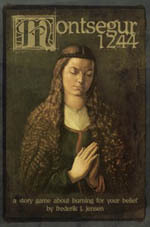 Believed to have accepted Consolamentum during the truce. From the seigneural family at Puivert. Parfaite from 1240. Householder on Montségur. Sister or cousin of Berenger, the seigneur of Lavelanet. parfaite at Lauran in 1230. Lived with Corba de Pereille at the Château of Montségur. parfait from Tarabel, ordained deacon at the Château of Montségur. Sergeant. 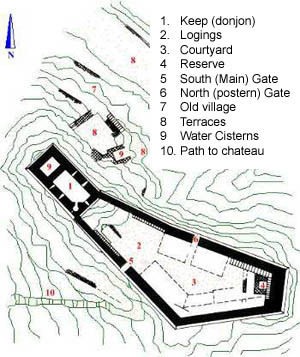 Arrived to reinforce the Château of Montségur May 21, 1243.
of Laroque d'Olmes. Sergeant residing at Montségur since since 1236 with his wife. wife of Sergeant Arnaud Domergue. A Lady from theLahille branch of Fanjeaux. parfaite in 1227 and householder at Montségur. Cow herder from d'Odars near Lanta and a believer since 1230. Sergeant at the Château of Montségur in 1243.
knight from Soreze and Durfort. Believer in 1237.
of Casses. At the Château of Montségur with his brother. knight and co-seigneur of Montgaillard in Lauragais. Believer in 1230. Present at the Château of Montségur since 1243 and reported "burned." 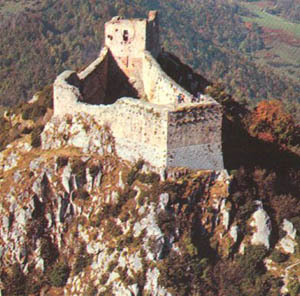 Condemned by the Inquisition in Moisac in 1233 and escaped to the Château of Montségur. Dispossesed knight from Laurac. 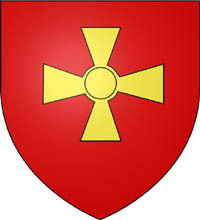 Defender of Castelnaudary against Amaury de Montfort in 1219-1220. At the Château of Montségur from 1240. One of the leaders of the massacre of the Inquisitors at Avignonet. Seriously wounded 26 February 1244. Dispossessed knight from Laurac. Believer in 1232. 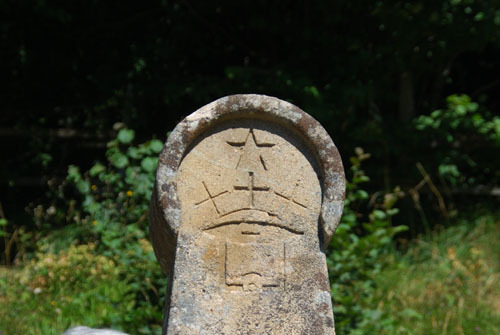 From Tarabel. . Head of the Cathar Church at the time of the seige. Known to be at the Château of Montségur in 1232 and reported "burnt with all the others." From Mas Saintes-Puelles, parfait in 1229 and reported present at the Montségur in March 1244. Assumed to be among those executed. Related to Arnaud-Roger de Mirepoix. Believer in 1227, and received the Consolamentum during a grave illness in 1229 at Limoux. 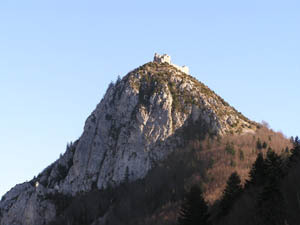 Arrived as a parfaite at the Château of Montségur in 1240. Wife of sergeant Pons NARBONA. Squire to Raymond de Marseillan, and brother of Pons Narbona. of Carol and Cerdagne. Sergeant. parfaite from Belesta. 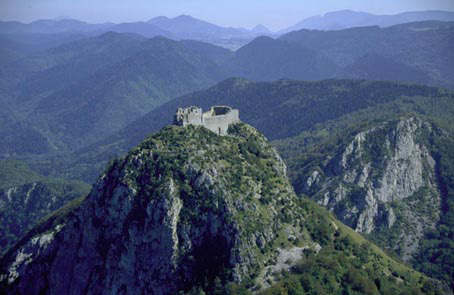 Arrived clandestinely at the Château of Montségur in October 1243 with a letter from the Cathars of Cremona in Italy. daughter of Raymond and Corba de Pereille. 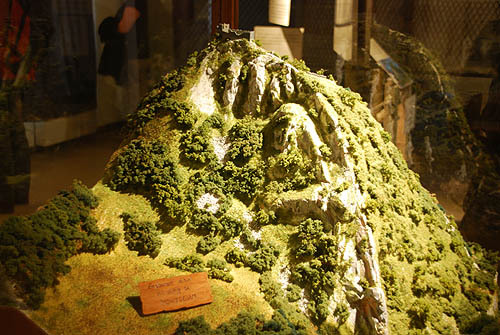 arrived at the Montségur in 1237.
sergeant, agent of Raymond de Pareille. With CLAMENS, consigned the Cathar treasury at the Château of Montségur to Pierre-Roger Mirepoix on March 13, 1244. From Bram. Captured at the Château of Montségur and returned for execution by fire at Bram. From Saint-Paul-Cap-de-Joux. Courier. 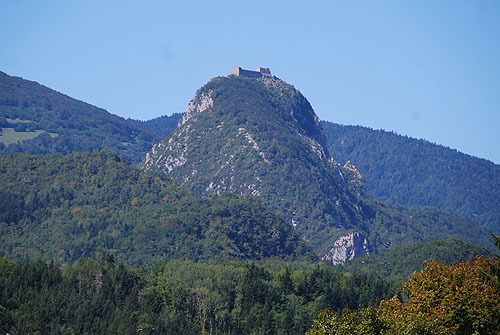 Arrived at the Château of Montségur on January 1, 1244, bearing a letters from the Cathars of Cremona. Merchant from Mirepoix. Believer since 1209 - arrived at Montségur 1236. Brother of sergeant Bernard de Joucou and uncle of the Narbona brothers. Believer in Lavelanet in 1232 and a parfait at Montségur in 1240. Dispossessed knight from Laurac. One of the leaders of the massacre of the Inquisitors at Avignonet. Believed to have received the Consolamentum with the knights Guillaume de Lahill and Brezihac de Cailhavel. assistant to Cathar Bishop Bertrand Marty. Rixende de TELLE (or TEILH). Mother superior of the Parfaites at Montségur during the siege. from Limoux. 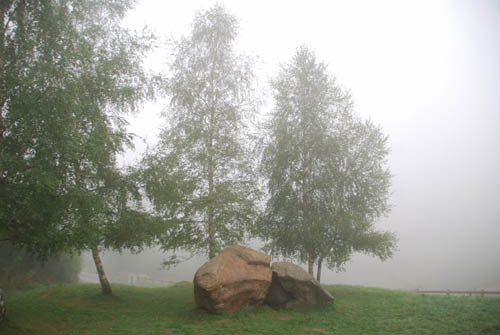 Arrived at the Montségur before February 14, 1244. Believer since 1224 and ordained a Parfaite at the Château of Montségur in 1234. 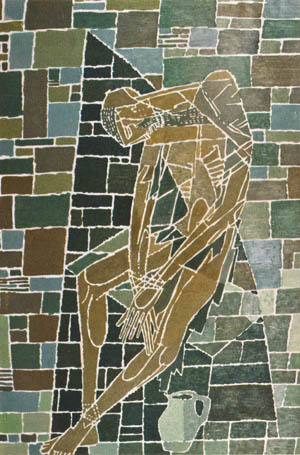 Believer at Montségur from 1240. An excellent book about the Cathars is Massacre At Montsegur: A History Of The Albigensian Crusade by Zoe Oldenbourg - which is good history, and well written. If you prefer fiction you might be interested in some of the following. None of these represents reliable history, and some are pure fantasy. 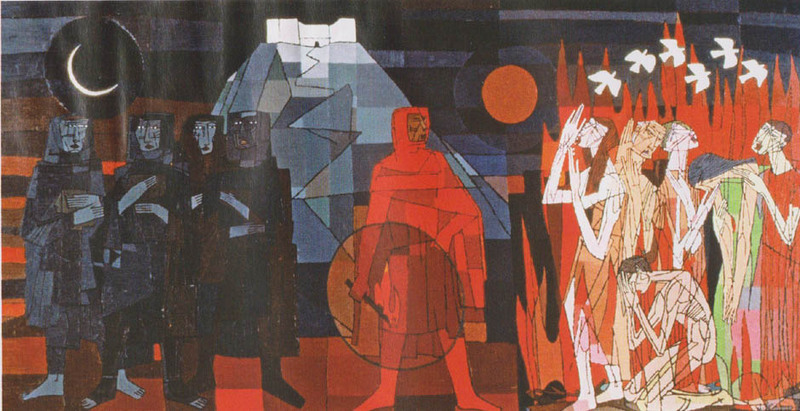 In Peter Berling's pentalogy The Children of the Grail and in Julia Navarro's La sangre de los innocentes, the siege of Montségur is described. In Dan McNeil's novel The Judas Apocalypse, set just after the landings at Normandy during the Second World War, a German archaeologist and a group of American soldiers go looking for Cathar treasure removed from Montségur. 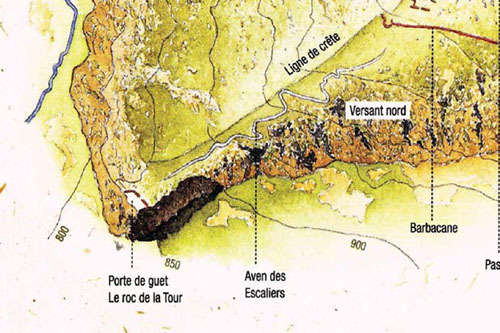 Sylvie Miller & Philippe Ward's novel The Song of Montségur (Le Chant de Montségur, 2001) . Kathleen McGowan's novel The Expected One incorporates the story of the Siege of Montsegur. 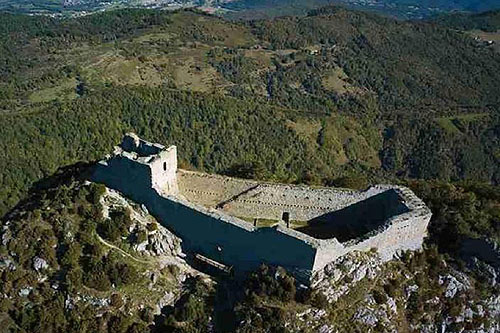 Kate Mosse's novel, Labyrinth also describes the besieging of the Cathars at Montsegur. German thrash metal band Paradox's album Heresy deals with the persecution of the Cathars. 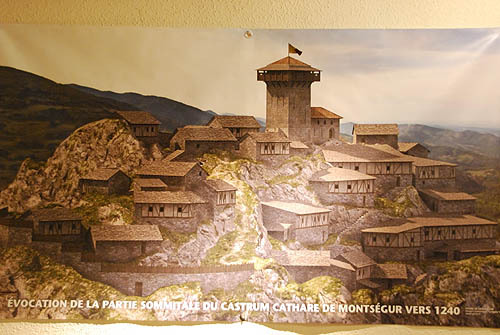 The Era albums allude to the history of the Cathars, and the first album mentions Montségur on its cover. Below are the lyrics of a song by Iron Maiden called Montségur (from the Dance of Death album) inspired by Bruce Dickinson's holiday stay near Montségur. I stand alone in this desolate space. In death they are truly alive. Massacred innocence, evil took place. The angels were burning inside. Centuries later I wonder why. What secret that they took to their grave. Still burning heretics under our skies. Religion still burning inside. At the gates and the walls of Montségur. Blood on the stones of the citadel. As we kill them all so god will know his own. The innocents died for the pope on his throne. Catholic greed and its paranoid zeal. Curse of the grail and the blood of the cross. Templar believers with blood on their hands. Joined in the chorus to kill on command. Burned at the stake for their soul's liberty. To stand with the Cathars to die and be free. The book of old testament crippled and black. Satan his weapon is lust. Living this evil damnation of flesh, back to the torture of life. The perfect would willingly have died at the stake and all of their followers slain. As for the knowledge of god they had claimed. Religion still burning inside. As we kill them all so god know his own. The innocents died for the pope on his throne. Burned at the stake for their soul's liberty. Still burning heretics under our skies. Death is the price for your soul's liberty. To stand with the Cathars and to die and be free.